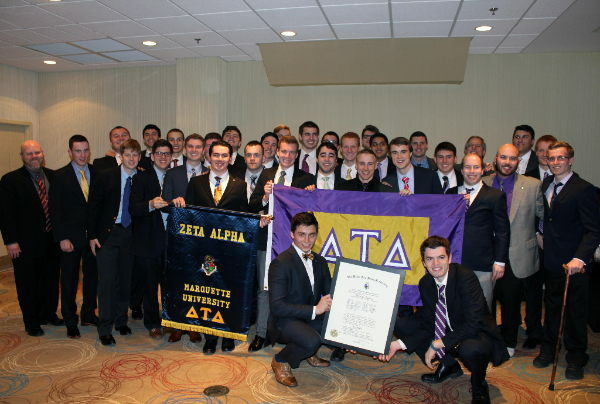 On Sunday, May 1, 2016 Delta Tau Delta welcomed its newest chapter, Zeta Alpha, at Marquette University. The installation festivities which included a chapter retreat, Ritual ceremony, and an evening banquet were held at the Aloft Hotel in Milwaukee, Wisc. Saturday afternoon 35 founders experienced the Rite of Iris and Initiation ceremonies conducted by the Beta Gamma Chapter from University of Wisconsin-Madison. International Secretary, Bruce Peterson (University of Wisconsin – Milwaukee, 1975), presided over the ceremonies and was joined by Northern Division President, Mark Starr (Case Western Reserve, 1995). In attendance along with Zeta Alpha Chapter alumni from Marquette were Delta Tau Delta alumni from UW-Milwaukee, Auburn University and DePauw University. At the conclusion of the ceremony Tim Poellmann (University of Wisconsin – Madison, 2013) was installed as chapter advisor. The installation banquet provided an opportunity to celebrate the newest chapter in the Northern Division. Executive Vice President for Delta Tau Delta, Jim Russell (Purdue University, 1975) provided chapter president Jarrett Smalley (2017) with the Eversole Badge, a gift given to the president of every new chapter to be passed down to each president thereafter. In Russell’s address on the current state of the fraternity he announced the Fraternity is currently larger than ever before as the Fraternity surpassed 10,000 undergraduates for the first time in the 158 years of existence. Mark Starr presented the chapter Guide, Patrick Niemaszek (2018), with the chapter Bible, Ritual books, and robes. In his address to the chapter he acknowledged the chapter’s positive influence on campus thus far and encouraged them to continue to challenge the status quo. The keynote address was given by Bruce Peterson who emphasized the importance of sharpening your “axe.” Peterson said, “While striving to be better, always remember to focus on your tools, knowledge and ensure you are fine tuning your skills to work smarter.” To help with the continued self-improvement of each individual member he encouraged the men to attend the Fraternity’s many leadership experiences such as Ignite and the Charge. Following his address he presented Jarrett with the chapter charter with all 35 signatures of the founders of Zeta Alpha Chapter.